This is a clear polyester static cling film that will adhere to most polished surfaces without leaving a residue behind. It is PVC-free and provides optical clarity ideal for high quality graphic applications. All surfaces must be clean before application or re-application. These can be diecut to any shape or size. 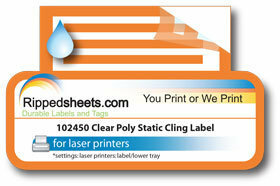 See our 802450-54 for custom printed opaque window clings.